Well folks..there may be some radio silence for a few days now. Take a minute to think about Mom this coming weekend. Tell the Moms in your life how important they are to you. Every once in a while my birthday falls on Mother's Day (like this year) and in years past I would be a little bummed out to share a day with all the Moms, but you know, I couldn't think of a better way to spend the day. I am so blessed to have so many wonderful women in my life. [t]he jungle grows more dense as the river boat slowly makes its way into the deep interior. A snake slithers into the water, flushing a brilliantly plumaged bird who soars into the clearing above a quiet village. Here is a musical portrait of a tropical village deserted in the mid-day heat. 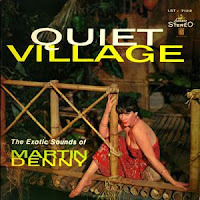 Seven years later, in 1959, Martin Denny added exotic sounds to the song, and his instrumental version made it to number four on the pop singles chart and number eleven on the R&B chart. . Denny also recorded a bossa nova version of the song in 1964 and a version on Moog synthesizer in 1969. In 1977, The Ritchie Family recorded a disco version of the song and added vocals. The single was included on theirAfrican Queens album. Along with the album's title track as well as "Summer Dance", "Quiet Village" hit number one for three weeks in 1977. However, unlike the Martin Denny version, The Ritchie Family recording did not chart on the pop singles or R&B chart. .
(note +) The original single hit was a mono recording edited to 2:42, and this length version was used on the Liberty album as well. There was a different recording, done in stereo, used on stereo Liberty LP's and many subsequent reissues. The full length version only made is first appearance sometime in the 1980's." I hope to blog from the road.